This exhibition displays the surprising encounter of four artists of different origins, languages, cultures and ages; all of whom are working their earthy material in the same spirit. 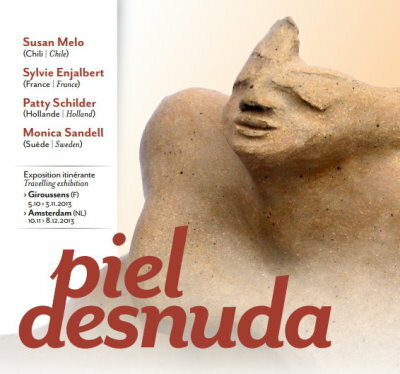 Clay, this fine and primary material, has led them on a search for themselves, their origins, an uncovering that reveals nakedness, essences and natural forms. Their individual journeys arrive at one focal point, a form of awareness that they have named Naked Skin. A possible echo of the ancestral beliefs of the Andean Cosmic Vision, where unexpected meetings are never accidents. Each independently, has sought the same thing, her own response to Naked Skin. The purpose is to show this exhibition in as many country’s as possible and to let other ceramists with the same spirit join the traveling exhibition. The start was 2013 in Centre Ceramique au Giroussens, France, the next Galerie Stam in Amsterdam, Netherland. In 2014 we went to Arcueil in France and Keramicos, Haarlem, Netherland.